First Question: What is essential, inexpensive, nutritious, fun to make, comes in a cardboard box and feeds 216 hungry people? Answer: One box of 36 bags of Kids Against Hunger meals packed by volunteers and sent to a third world country. Second Question: What is the latest compassion ministry offered by the national office of Operation Inasmuch? Answer: Packing low-cost, nutritious meals through the Kids Against Hunger program, thousands at a time. Kids Against Hunger food packing events are perfect for almost all ages and bring people together working, across generational lines. 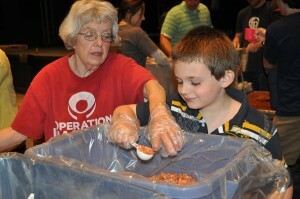 Operation Inasmuch, Inc. became an official satellite of Kids Against Hunger (KAH) in March. As such the Inasmuch ministry is now able to offer congregations, church groups and businesses the opportunity to pack a large number of dehydrated meals that are sent to Haiti and other third world countries. 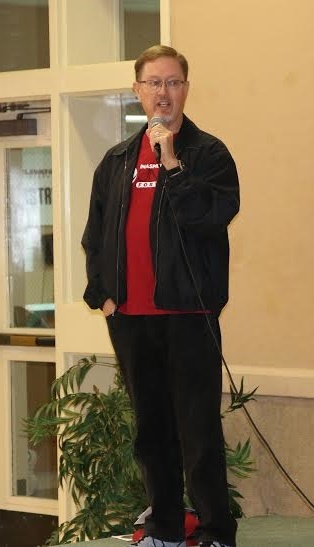 “We applied to become a KAH satellite because we see this ministry, feeding hungry people, as aligning perfectly with our mission of mobilizing believers to minister to people at their point of need,” says David Crocker, Executive Director of the Inasmuch ministry. “Also, we see it as an opportunity to offer a new way to serve for those churches already using the Inasmuch model. Finally, we see the food packing project as a simple and effective way of bringing congregations together as part of a larger Inasmuch United event.” Kids Against Hunger (www.kidsagainsthunger.com) is an international food-aid organization founded in 1999 “to reduce the number of hungry children in the USA and to feed starving children throughout the world.” The Inasmuch ministry is one of about 100 satellites across the nation affiliated with KAH based on New Hope, Minnesota, outside Minneapolis. Last year alone, KAH satellites packed forty million meals for hungry people around the world! Food packing events are fun and build a community spirit for the group working together. The Inasmuch ministry has already conducted two KAH packing events: Central Baptist Church of Bearden, Knoxville, TN on March 17—53,118 meals packed—and Faith Promise Church, Knoxville, TN on April 13—50,000 meals packed. More than 300 volunteers were involved at Central Baptist and about 170 at Faith Promise. Churches interested in staging a food packing event should contact the Inasmuch ministry at 865-951-2511 or david@operationinasmuch.org. Do you ever wonder what pastors worry about? What they think is important? Discipleship Issues (86% Significantly or Highly Important). This tells us is that ministry leaders on the front lines are most concerned about how the church is equipping their people to be authentic followers of Jesus in a post-church culture. It’s encouraging to know that Operation Inasmuch’s ministry “scratches where ministers itch.” That is to say, we provide motivation, education, and structure to help believers do what Jesus did and what He commanded his followers to do. Increasingly, authenticity is measured not in theological terms or denominational affiliation, but in hands-on demonstrations of Jesus’ heart in local communities. 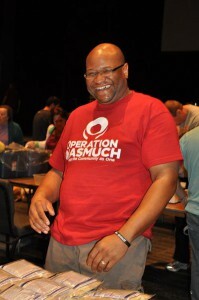 Operation Inasmuch has helped hundreds of congregations to be the hands and feet of Jesus for their neighbors in need. In fact, the best explanation of the astounding growth of the Inasmuch ministry is that it provides proven ways for churches to walk the game they talk. Based on the TCP survey, it appears that the need addressed by Operation Inasmuch is on the rise: to get church people out of the sanctuary seats and into the streets! Perhaps God put Operation Inasmuch in place to help His people do what He called them to do. Perhaps A Compassion Revolution really is underway! To God be the glory! !